MK Azhagiri today conducted a peace rally to mark the 30th anniversary of the late DMK leader Karunanidhi. At that time, he said it was not a political rally. 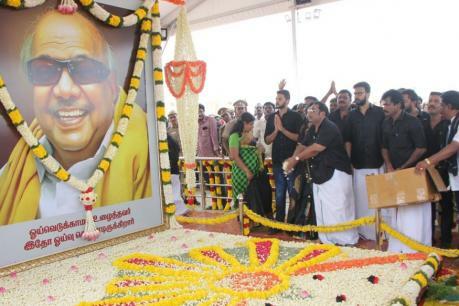 On the 30th day of Mrs. Karunanidhi's day, a peaceful rally was held to MK Azhagiri Marina. The rally from Chennai Tiruvallikai police station ended in the memorial at Karunanidhi in Marina. Subsequently, the devotees paid tribute to the beauty of Lord Anjaneya and Karunanidhi. His son Durai Dayanidhi, daughter Kayal Vali and wife Gandhiji Alagiri paid homage. Alagiri met journalists later. He said, "Thanks to the rally participants. He said that this is a full-blown march, not a rally for politics. Alagiri said that about one lakh people attended the rally.